Fifteen years ago, an opportunity presented itself to Brigitte Pagés de Oliveira. She bought several buildings surrounding the 19th century Hôtel de Chartrouse in Arles with the intention of starting a maison d'hôtes. 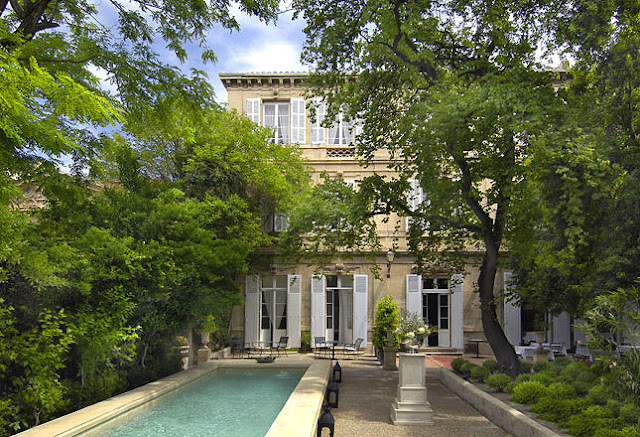 Two years later, she opened L'Hôtel Particulier with six rooms opening onto a massive garden. I remember well hearing the initial acclaims about this incredible property - unusually tucked into the unfashionable Roquette neighborhood - and so was delighted when it was the first hotel in the region to achieve a five-star rating in 2009. 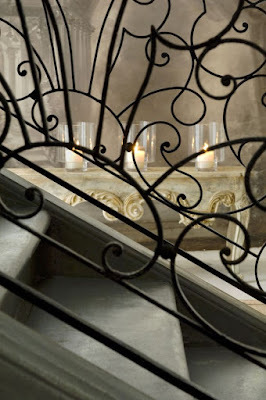 I think what many people have responded to in the hotel is the ease with which Madame Pagés de L'Oliveira has made an elegant link to the property's past. "I did not want to do a new decoration but rather put back what existed at that time," she has said. And oh, what an exceptional possibility that entailed. 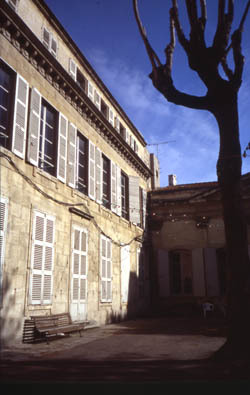 The Hôtel de la Chartrouse is one of the largest hôtel particuliers or private mansions amongst the 70 or so remaining in the center of Arles. It was also the last to be commissioned by une famille de notables. 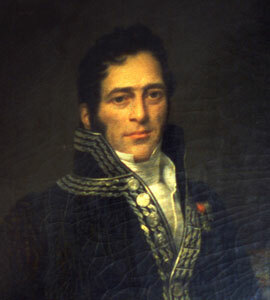 Guillaume Michel Jérôme Meiffren de Laugier, after being named Mayor of Arles in 1824, felt that he needed a home "worthy of his position." Despite being a wealthy land-owner (and therefor someone who would normally have been a member of the chiffonistes or Arles' pro-Royalist party), during the French Revolution he was a soldier in the Allobroges regiment of the Armée du Midi, which had been formed to keep the peace in large Provençal towns such as Marseille and Montpellier but especially Arles. However, he changed tactics by courting the rise of Emperor Napoleon, who in turn granted him the title of the Baron de Chartrouse in 1811. It was a title that he would continue to wear proudly even amidst periods of political turmoil during his six year-long tenure as mayor, then as Deputy of the Bouches-du-Rhône until 1834. His son Jules, who also became mayor during the Second Empire and held the office for ten years, did the same. The people of Arles have much reason to be grateful towards the Baron, even today. For while such prestigious visitors as King Henri IV had already strongly suggested that better care was to be taken of the vestiges of its numerous Roman monuments, it was the Baron de Chartrouse who, in 1825, finally put words into action. He formed Arles' first Archeological Committee and ordered the clearing and refurbishment of both the Arena and the Antique Theatre. In the arena alone, a fortified "town within a town" had sprung up over the centuries and 212 houses and two churches had to be destroyed! So, it is thanks to him that we have these two beautiful monuments in their preserved state today, an enormous feat. 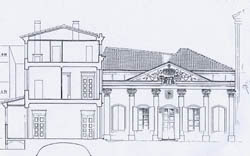 He also brought about the construction of the municipal theatre and library as well as establishing the main road between Salon-de-Provence and Nimes - in so doing guarding Arles' importance as commercial crossroads. So yes, he most certainly deserved an exceptional home. The main building of the Hôtel de la Chartrouse was built in the strict Neo-Classical style that was heralded by the Parisian architects Percier and Fontaine at the time. 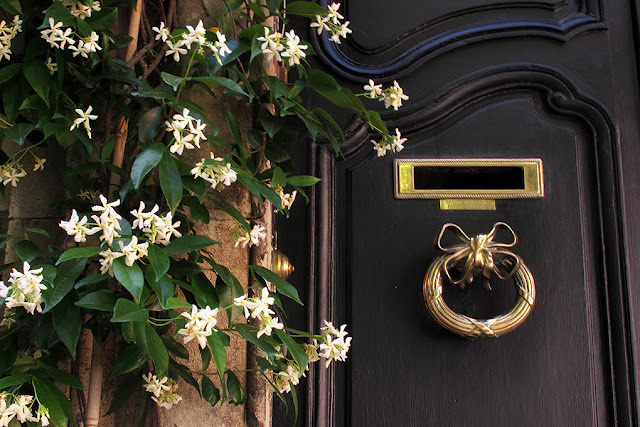 One entered through a portail monumental on what was renamed the rue de la Chartrouse in 1830 and into an open garden doted with an 18th century pavilion. 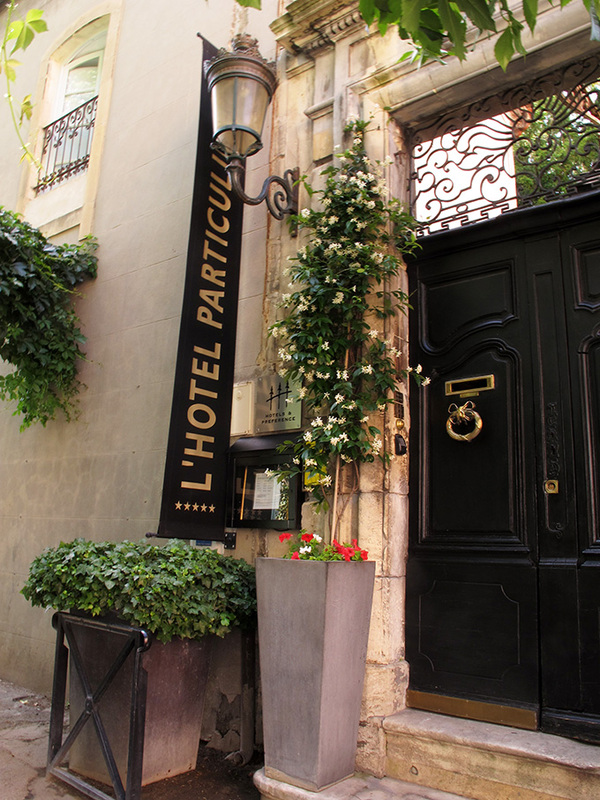 Today the main entry for L'Hotel Particulier is on the rue de la Monnaie in a similarly elegant building that was later constructed on the initial property holding. 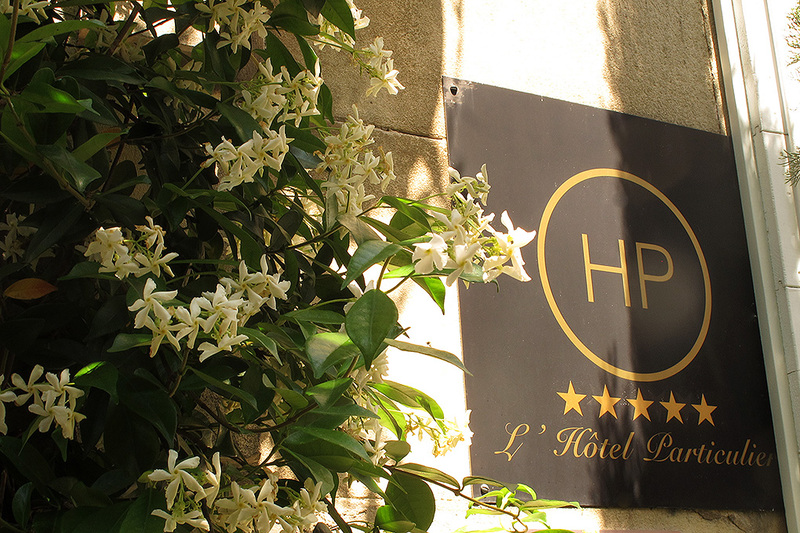 The leafy platane trees are still providing shade nearly two hundred years later for the guests of the hotel. The bassin that is the pool was designed exactly in the style of the period as well. While relaxing in this garden in the midst of the city, one can enjoy this beautiful space in utter privacy, just as the Baron had. For him, it most likely was a place of great importance as he was also a prominent botanist and ornithologist. Indeed, a rare example of the book that he created with the artist Coenraad Jacob Temmick sold for $12,260 at Christie's in 2013. Due to Arles' highly unusual and complex history during the French Revolution (to be reductive, it was largely a pro-Royalist stronghold), many of the finest hôtel particuliers were left largely intact - something practically unheard of in the South of France. Such was the case for the Hôtel de la Chartrouse and amazingly the salons, ornate stairwell and many of the rooms had kept their initial proportions and held elements of the original decor when Brigitte Pagés de Oliveira acquired the property in 2000. She did restore a few of the bedrooms that had been cut in two to their original size of 50 m2 (538 sq. feet) and created a style that, while eminently conscious of the hotel's prestigious predecessor, is now uniquely her own. "And what does that entail?" you might ask. After all of this history aren't you extremely curious to see what this property is like today? It is after all, one of the most beautiful hotels in all of Provence in my (slightly biased) opinion. PS. I would be remiss if I didn't add that it really was quite a risk on Brigitte Pagés de L'Oliveira's part to open a luxury property in the Roquette neighborhood, no matter how fascinating the hôtel was and is. While one of the oldest neighborhoods in Arles (near the Rhone River, it was traditionally home to sailors and sea merchants), it was one that tourists never set foot into due to its reputation of being home to boisterous Roma families and drug-dealers. That is changing, in large part due to the success of the hotel. And while I am not a fan of gentrification, that there is now a string of thriving new restaurants on the nearby rue des Porcelets is by no means an accident, something that is a great boost to the local economy. It is a neighborhood that is on the move and if you would like to see more of it you can do so by clicking here, here and here. If you enjoyed this post and happen to find yourself in Arles, I give 2-3 hour private guided walks for up to six people that covers the 2000 years of history and culture of this incredibly diverse town. Please feel free to contact me if you are interested at robinsonheather@yahoo.com for further details. Thank you for being here and for those of you that are visiting from chez Ellie, bienvenue! Lovely hotel, elegantly restored. History regained and beginning of renaissance of the neighborhood. I "toured" the hotel. Abundantly impressed. Mrs. Abstract and I would love to stay there but it’ll be beyond our means. Yes, a five-star at five-star prices, Edgar! This place is ridiculously lovely and feel like booking now!! You are so wonderful, my dear friend. Scheme away! And yes, a link to both blogs has been sent to the hotel. I believe this Hotel is fit for a Contessa . All I can ever think when I see homes like this is "ONE family used to live here!!!" How absolutely gorgeous, and I love that the hotel is helping revive the Roquette. And I really loved the shared blog posts with Ellie, her sweet enthusiam and sense of humor (calling Arles a "little village" HA!!) while she walked us thorough each amazing detail. So much fun! Thanks! Such a beautiful hotel, and the history so interesting. Thanks Heather, really enjoyed this. Hope you are having a great weekend, Tracy. Alas, I fear that I will never see this place, but know that you have written the most evocative post about people who preserve, protect and honor the past. Brilliant, Heather. Always brilliant. I do love you !!! I loved reading your "tandem blogs" today! My best college pal is on her way to Provence next week and this is just her thing! Send it to her! I loved your last post...I want to go to Italy!!! Heather I too stopped over to Ellie's first and now to hear more background on the hotel is so fascinating. I love how your city has been beautifully restored in many ways like this and I would love to come to Arles when I do finally make it to France!! You are amazing! Thank you! Karena, when I first visited in 2003, Arles was quite different. Now there is always one if not several big restauration projects going on - neat to see! What a treat to read you and Ellie. I can't wait to see what La Contessa cooks up. Gorgeous. gorgeous. gorgeous!!! Ya, gotta give it to the French for style and taste! You both did it justice. Thank you. Just a note to let you know I have enjoyed each and every post of late .. even though you haven't seen a comment from me in some time. As I suspect you'll understand, I unintentionally took a "writer's break", beginning with my most recent French Foray .. and, yes, like all who write I have been in that place of self inflicted "non productive" guilt and angst. But never mind the cubicle surrounding my creative psyche .. this missive is to thank you for your creative flair. May the Cubicle of non-productivity stay far far away from your space .. and if it rears its nasty countenance, let me know and I shall charge in with the "Sword of Encouragement" and slay the disgusting "ne'r to do" so you suffer not the angst of my non-productive past month. Hmmmmmm, I think I'm back .. lol. As always, Heather, Mahalo et Merci for sharing your "Gift" .. It's a great one! Oh, you are most certainly back, Bill. ;) See? Sometimes focusing on others will do the trick so easily. Good karma and well-deserved. And don't put too much pressure on yourself - your readers will be there when you want. Me included! You have certainly whet my appetite for seeing the interior of this hotel. I love history, French and English history particularly. Now I'm off to click on your link. How delicious to know that these hotels particuliers stool remain, and to do lovingly and respectfully restore them. And... You are remarkable as always to read, my friend. High praise coming such a fine writer as yourself. Thank you. How I would love to show you around Arles someday!